Going to a yoga class to keep fit this winter? so mist the airspace & environment around you to enjoy. 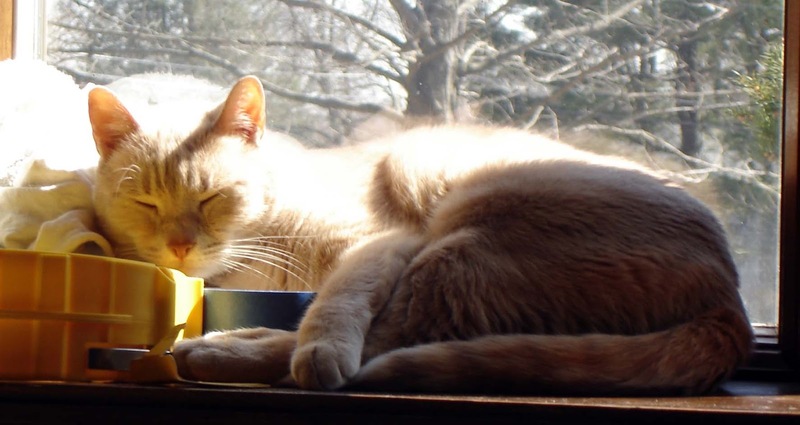 About 70% of Americans share their home with a cat or dog. We know your faithful furry friends are part of the family and caring for them is important… So here are some natural herbal tips you can trust. Animals have been using herbs for millions of years; since long before humans walked the earth, and much of what’s been learned about the healing attributes of plants is from observing animals, so lets return the favor. Fortunately many of the most useful herbs for pets may already be in your kitchen cabinet or are as close as your local market. Here are some of our favorites that can be used safely at home. Chamomile (Matricaria recutita) is a gentle effective home remedy that can be safely used in a broad variety of applications. A go-to herb for digestive upsets that arise from nervousness and hyper excitement. In the digestive tract, chamomile eases nervous spasms, helps expel gas, and reduces inflammation throughout the body. To make a tea steep use 1 tablespoon of the dried chamomile in 1 cup (8oz) of water; bring to a boil and steep 2o minutes, then strain and discard used plant material. Cool before use, and store refrigerated. For application cooled tea can be fed at a rate of 1 to 4 tablespoons per 30 pounds of furry body weight, or simply by adding it to your pets drinking water, as the animal will tolerate. For inflammation of the skin; including fleabites, contact allergies, and various bacterial and fungal infections, your cooled tea can be used as a soothing and healing antimicrobial rinse. Simply pour the cooled tea over your pet until drenched, massage into skin and allow to air dry. This can be repeated daily as needed. 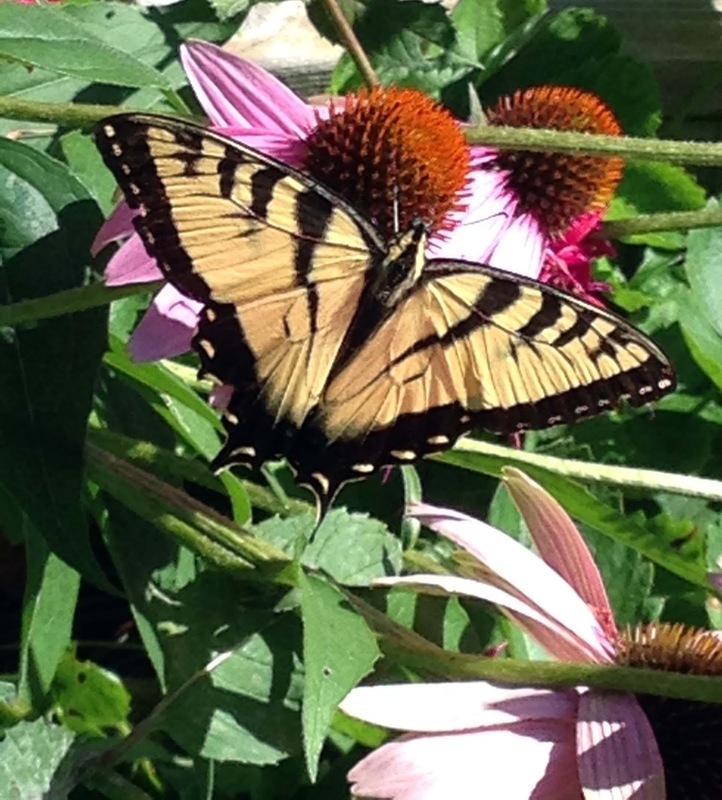 Echinacea (Echinacea purpea) is a gorgeous perennial that is easy to grow. The entire plant is useful to support your pet’s natural immunity in several ways. It also stimulates the lymph system helping the body to eliminate waste from the tissues. Try feeding 10 to 20 drops of an alcohol free tincture to your pet to naturally boost its immunity during times of stress or illness. Echinacea works well at relieving the pain and swelling of most insect bites and stings, especially when applied as a poultice. To make a poultice simply mash the flowers and leaves with a small amount of distilled water with a mortar and pestle. Apply the paste directly on the effected area 2 or 3 times a day until the irritation subsides. Fennel Seed (Foeniculum vulgare) serves as a gentle anti gas and antispasmodic agent that can be added directly to your animal’s food. In cases when your pet has a stomachache from overindulgence, fennel seed can work wonders. It is also a good nutritive adjunct for cats and dogs with chronic indigestion not attributed to a specific disease. Fennel also helps increase appetite and freshen breath by minimizing belching through its antibacterial activity in the mouth. To make a tea steep use 1 teaspoon of fennel seeds in 1 cup (8oz) of boiling water; steep until cool, then strain and discard used material. For application cooled tea can be fed at a rate of 2 to 4 tablespoons per 20 pounds of furry body weight, or simply by adding it to your pets drinking water, as the animal will tolerate. The leaf tea is said to be an effective skin and coat rinse for repelling fleas. Also an ointment can be made to soothe insect bites by melting ½ cup coconut oil in a small saucepan; then grind or crush a couple tablespoons of fennel seeds with a coffee/spice grinder or mortar & pestle, add to coconut oil and simmer gently for 15 minutes, strain and pour into a jar. Milk Thistle (Silybum marianum) This popular herbs biggest claim to fame is its ability to protect the liver from toxins and regenerate healthy liver cells. 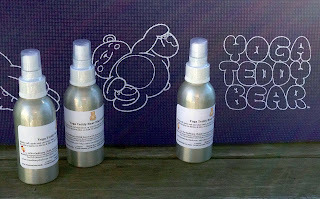 It can safely be used in cats, dogs, horses, and other furry friends. Many holistic veterinarians find milk thistle useful for protecting the liver during a toxicity related crisis such as exposure to toxic chemicals, or potentially harmful drug therapies, but the drug can safely be used at home as a preventative measure against invisible ‘what ifs’ that may exist in the environment such as toxic lawn chemicals or the residues of household cleaning products. Because some carnivores are deficient in their capacities to break down and digest plant materials a sweet tasting glycerin tincture of the herb is your best choice for daily use. The liquid form will allow quick and complete absorption into the body. Follow the manufactures feeding instructions for dosage. Parsley (Petroselinum crispum) so much more than a garnish it’s actually one of the most versatile plants around and an absolute must have in the home herb garden. Herbalists know parsley root as an excellent diuretic that is especially helpful rheumatoid conditions. For animals parsley root is useful in cases of arthritis that are caused or perhaps compounded by poor waste elimination. Cats and dogs can be given a tea of dried or freshly grated root; 1 teaspoon for cats and 1 tablespoon for dogs, a tincture may also be used. The leaves contain many volatile oils that have antiseptic qualities that are useful for urinary tract infections. Hands down the easiest and best way to use parsley is to juice it, then you can use by feeding directly, or in water, 1 teaspoon per 20 pounds of animals weight. The juice or a couple drops of the leaf tincture is excellent as a breath freshener. Valerian (Valeriana officinallis) Valerian is without a doubt the most widely recognized calming agent in existence. It works gently to calm the nerves and achieve relaxation without inducing an altered state like a prescription sedative. Herbalists use valerian for insomnia, anxiety, and to help the body relax the presence of physical pain. Valerian is very useful for our furry friends and best results can be had when administered 30 minutes before a stressful event. Try feeding 10 to 20 drops of an alcohol free tincture to your animal, and this may be repeated if no calming effects are seen after 30 minutes. 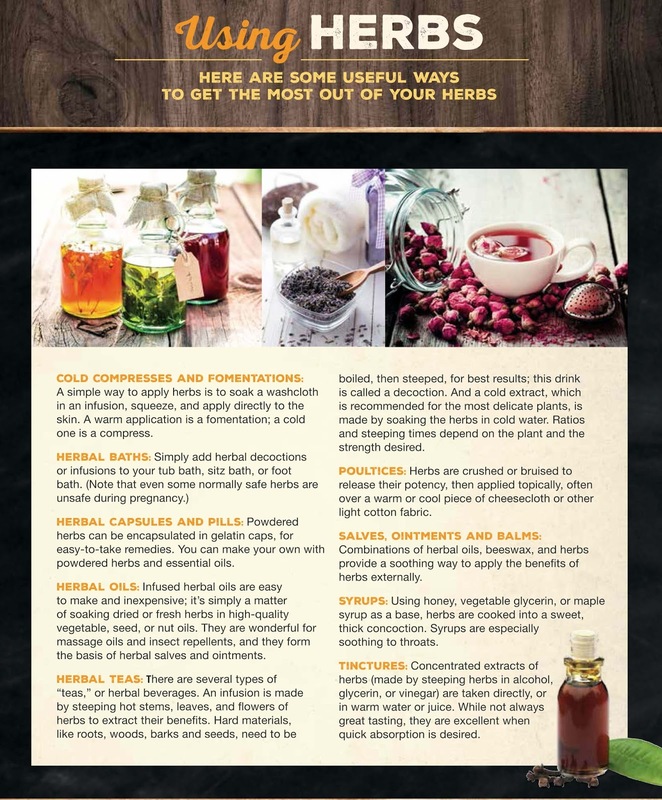 In December we posted some information about using herbs for health called: 'What Herb & Spice for What Health Use'... then we found this in our monthly sale flyer from Frontier Coop and thought it was a great collection of ways to apply natural herbal methods. Happy herbal healing! Rosemary is associated with the element fire and its planetary ruler is the sun. Although rosemary is native to the Mediterranean, it now grows throughout much of the temperate regions in Europe and America. Rosemary is one of the oldest incenses; when burned it emits powerful cleansing and purifying vibrations so it’s smoldered to rid a place of negativity. It is used in a variety of healing and love spells, and can be used as a substitute for frankincense. Rosemary contains substances that are useful for stimulating the immune system, increasing circulation, and improving digestion. Its memorable flavor and unique health benefits make it an indispensable herb for every kitchen. Who doesn’t love the aromatic smell of rosemary? Picked fresh off a bush, bought in the market, or cooked with your favorite foods. Most recipes call for rosemary leaves, which can be easily removed from the stem. Rosemary is a wonderful herb for seasoning chicken and lamb dishes; or add to omelets and frittatas, tomato sauces and soups. Even better than butter - purée fresh rosemary leaves with olive oil to use as a dipping sauce for bread. 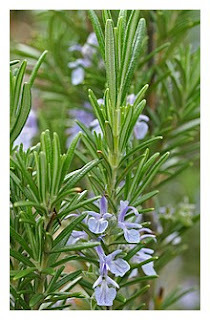 Rosemary grows on a small evergreen shrub belonging to the Labiatae family that is related to mint. Its leaves look like flat pine-tree needles, deep green in color on top while silver-white on their underside. Rosemary likes warmer soil and should be added to your garden after the danger of frost is past. Plant the seeds or cuttings in well-drained soil; be sure to leave plenty of room as rosemary can grow to 4 feet tall and spread that far too. Trim your plant regularly, especially after flowering occurs. Prune rosemary stems to use fresh, and store them in the refrigerator. Dried rosemary should be kept in a tightly sealed container in a cool, dark, dry place where it will stay fresh for about six months. What is a Crystal Grid? A crystal grid is created when you combine 2 or more crystals in proximity to one another. This combination creates a unique synergy between the crystals that feels different from each of the individual crystals on their own. A crystal grid is an arrangement of energetically aligned crystals, stones, and other items* charged by intention, on a specific geometric shape in a sacred space that focuses the universal force in a particular way for a determined purpose. There are many crystal grid designs based on the teachings of sacred geometry, and each has a precise use and meaning. The crystal grids shown are on a cherry wood flower of life mandala my husband made for me, and are shared in our homes kitchen where I spend a lot of time. Consider the location… it’s nice to take a moment to decide where you want the grid, and how long you intend to have it in place. Are you using any type of alter cloth or other materials to define your grid area? Is it in an area where it will be disturbed or in the way? Creating a crystal grid is a potent way to tap into and amplify the energies of your intentions; and is used by many as a meditation practice. 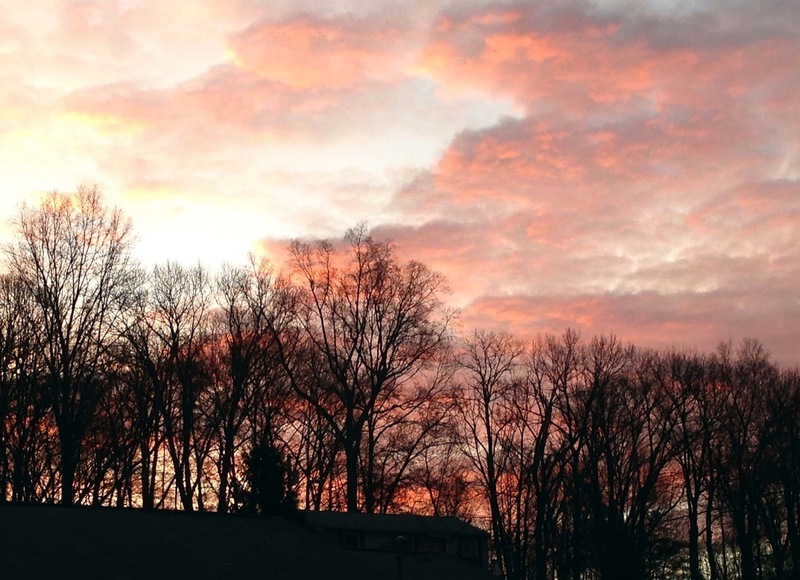 Creating an intention… this means you decide what you want the grid to amplify, support or signify. What is your purpose for this particular grid? Maybe you want to attract or manifest something like a new job or relationship; create something artistic, or anything else you want to bring into physical form. Perhaps you want to forgive, release, or even shift something that you’ve been stressing over. Once you’ve decided on your crystal grid intention look at the crystals and stones and choose the one that represents this intention best for you and this will be your center stone, the anchor or focus crystal for the grid. Place your center anchor stone first and then you can begin placing additional surrounding crystals, stones, and other items* to your grid… allow yourself to flow naturally with what you want to occur for you and the crystal grid. Take time to clearly state your intentions and define the aspects that are represented in your crystal grid as you set your crystals and other items. Allow the process of crystal gridding to be joyful… savor the time you spend connecting with your intentions. *other items: You might consider candles, flowers or herbs; a figurine or statue, jewelry, photos, or other beloved items. 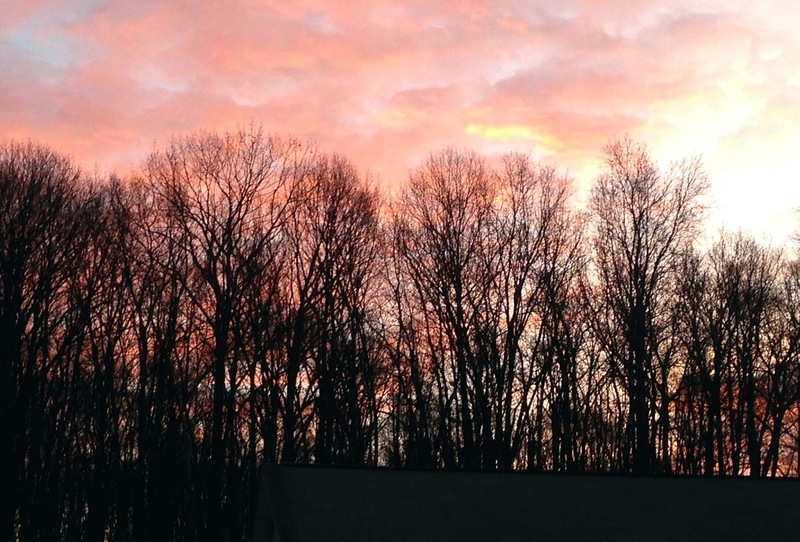 A new year's beginning... Go confidently in the direction of your dreams! Welcome 2016, share joy and make a wish!